August 16th in Plugin Lists, Wordpress Plugins by Wordpress Jedi . Role Based Help Notes: provides your members with a private area to share information based on their role. The plugin has a widget as well. Dashboard Notes: use this plugin to create notes and instructions for your clients within the WordPress dashboard. You can include a logo and choose where to show your notes. Collaborate Notes: a lightweight task management plugin for WordPress. Lets you add, edit, and delete notes easily. You can assign notes to multiple users and set reminders for notes. User Notes: this plugin lets you keep private notes about each user that only admins can see. This could prove useful for membership sites. 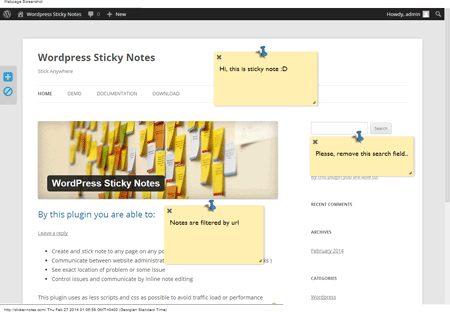 WordPress Sticky Notes: lets you stick notes on any page at any position. It handles notifications for people tagged in your notes. It is useful for giving your developer feedback on issues. Have you found better WordPress plugins for creating and sharing notes? Please share them here.